Samford University will celebrate Family Weekend Sept. 18-20 with a full schedule of activities that will include some new options. “Home is Here” is the theme for the weekend, which begins with new Parent Academy classes on Friday afternoon followed by a reception, worship, a live stage performance, outdoor movie, football and more before concluding with the annual Hymn Sing on Sunday. Online registration will open at noon (Central Daylight Time) on Monday, Aug. 17. Parents can expect to receive an advance email about registration. Because some events have limited seating, early registration is encouraged. 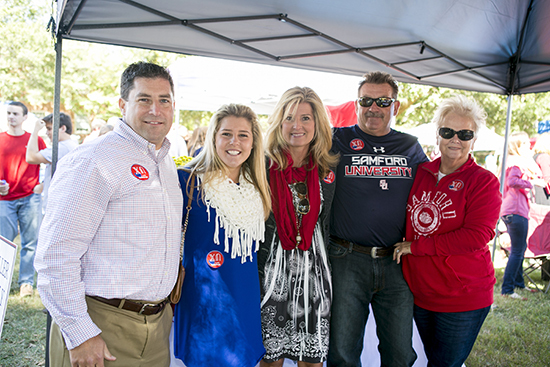 “We look forward to welcoming our Samford families back to campus for Family Weekend just as much as our families look forward to seeing their students,” said Samford director of parent programs Susan Doyle. Parent Academy will offer parents a new opportunity to experience Samford’s academic side, Doyle said, adding that the classes will represent every area of Samford’s undergraduate offerings. The one-hour sessions will begin at 1 p.m. and 2:30 p.m. on Friday. Topics include a Biblical perspective of character, the reliability of eyewitness testimony, trends in the business of sports, the development of “Betterocracy,” astronomy, cultural perspectives, cinema as an academic discipline, a culinary workshop using fall produce, music in Christian worship, Functional Behavior Assessment principles and “The Allegory of the Cave” excerpt from Plato’s The Republic. Course descriptions and an opportunity to sign up will be provided on the registration site. While parents are in class, younger family members may participate in a Tiny Sam Photo Scavenger Hunt on the quadrangle. The family that wins the hunt will win a Step Sing Weekend package that includes tickets, hotel stay, dinner and more. A Welcome Reception with Samford president Andrew Westmoreland will be held at 4:30-6:30 p.m. in the new Brock School of Business building. Other Friday evening events are a choral vespers service, a Wright Center Signature Series performance of Raisin’ Cane and a family-friendly Movie on the Quad. Saturday’s schedule begins with a 7:15 a.m. Parent Prayer Walk prior to the Parents Association Breakfast in the dining hall. Various departments and organizations will host open houses and events around campus at 10 a.m.
Tailgate lunch on the quadrangle from 11:30 a.m. to 1:30 p.m. will precede Samford’s 2:30 p.m. football game versus the University of Tennessee at Chattanooga in Seibert Stadium. Several seating options will be available for Family Weekend guests. New this year is the Tailgate Club tent, which will allow ticket holders to enjoy the game with food and refreshments under a cool shade. Saturday evening is unscheduled to allow for individual family time activities. Family Weekend concludes with the popular Hymn Sing at 2 p.m. on Sunday. The annual Samford tradition features congregational singing of hymns and gospel songs selected by audience participants. For more information on any of the events, ticketing or registration, email parents@samford.edu or call Doyle at (205) 726-2375.